JNN 30 Dec 2014 ISLAMABAD — Pakistan’s political leadership in the presence of the Army Chief and ISI Chief agreed on Wednesday, 25th Dec to establish Specialized Courts Headed By Military Officer for suspects accused of terrorism or extremist views, upending the constitution in a bid to aggressively crack down on terrorism after last week’s Peshawar school massacre in Peshawar. After a day-long meeting to formulate a new counterterrorism strategy, Prime Minister Nawaz Sharif and the leaders of more than a dozen political parties said the courts would be created to shift the country onto a wartime footing. A somber-looking Mr. Sharif appeared on national television to speak to the Nation. “The Peshawar attack has shocked the nation. We will not let the blood of our children go in vain,” Sharif said.
. “I have a very loud and clear message for those terrorists who killed our innocent children: There is no space for you in this country,” Sharif said. While in a Major step after the Peshawar incident in the past week, Pakistan has lifted a six-year moratorium on executions of Death Penalty , and even atleast 6 convicts have also been executed , while on the other hand Armed forces has expanded its military operations against terrorists across the country against terrorists calling themselves Muslims , rounded up hundreds of alleged terrorist sympathizers from major cities . Army Chief’s Urgent visit to Afghanistan immediately after the Peshawar Attack , in which he told the Afghan and ISAF loud and clear that , No more Cross border terrorism will be ignored , as now it is the time you take action against those terrorists acting against Our Nation , or we will our selves take the necessary action to eliminate those responsible for it , who so ever may be responsible for terrorist activities from across the border . And in a surprise move, Sharif even singled out terrorist groups in the country’s eastern Punjab province, many of which have been historically nurtured by Pakistan’s intelligence agencies. While Mr. Sharif’s party, the Pakistan Muslim League-Nawaz, has been always a supporter of these terror Networks in the past of turning a blind eye to terrorists in the province for the sake of political expediency. As the PML ( N ) itself was even Nurtured under the Umbrella of the Army Establishment , of General Zia ul Haq , who was the creator of these Jihadi elements and sowed the seeds of extremism and sectarianism , under which all these terrorist Networks Nurtured. Sharif, who until this summer advocated peace talks with the Taliban, until a decision by the Top Army Brass to launch an All Out Operation in North Waziristan called “ Zarb e Azb” . After which the Political set up of the country, which even had soft corner for the terrorist fighting against the Nation to realize that now they even have to stand against them or otherwise they have to face the Music, which is Being Played by the Loyal Armed forces of Pakistan. Under the proposal agreed on Wednesday, a military official of the Colonel Rank will serve as the judge in cases involving terrorism suspects. The goal of the courts will be to quickly dispense of those cases, officials said. 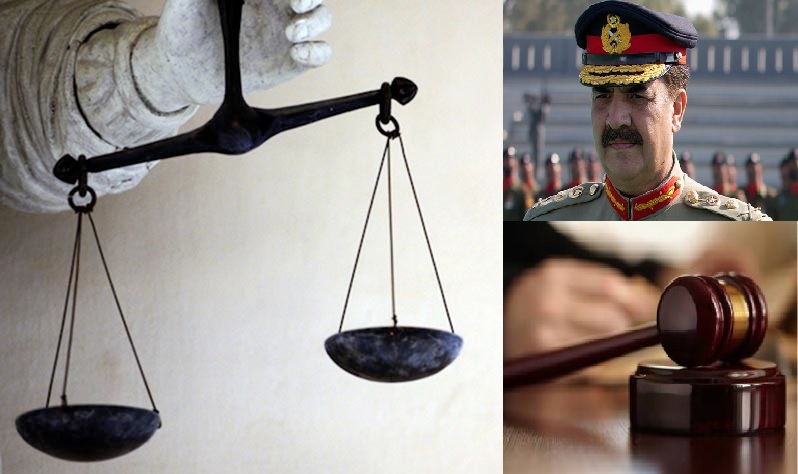 While as per the Army Rules the Appeals of such cases are also Heard by the Army Personnel of Higher Ranks, and that also in the stipulated time , and thus Justice can be delivered By the Judges , who are even Soldiers and are not afraid of dispensing the Justice at whatever be its cost , who are trained for even laying their lives in the Line of Duty. But the new Special Courts, which are said to be established for a Period of at least two years , at the same time these courts has also alarmed the Top Political Leadership of the country , who has earlier given a green signal for the formation of Special Courts Headed by Army Personnel , who were under immense Public Pressure in Reaction of the Peshawar Massacre , and at the same time were afraid of the Army Establishment which was directly hit in the incident , as most of the Political Leadership is directly involved and are accused of terrorism related cases, in different courts, which they always have manipulated , due to their Political Influence , which have always benefited them ,while as a Bold example, the Previous Chief Justice of Pakistan Iftikhar Chaudhry , who was upto to the core Politicized , and had ruined the Judicial system of Pakistan , by working on the foreign Agenda . So Now the situation is that the Only remedy for the cleansing of the terrorist Networks, terrorism and extremism is the establishment of Military Courts, while the Personal interest of the Political Brass of Pakistan have come into the way of the remedy , as they are trying to Play in such a way that , they remains Untouchables by the Army Supervised Courts , so they can be safe and carry on with their Dirty Business . Currently, most terrorism cases are tried in civilian courts, except for attacks that directly target military installations or personnel. Pakistan’s clogged & Corrupt Judicial system has even come under repeated criticism from the National as well as the International Intelligentsia as too many suspects have been freed on technicalities or appeal. But analysts say anger within the country is creating an opening for the new Army chief, Raheel Sharif, who is a Soldier to the Core and a Patriot , to take the Control of the ever Worsening Situation of the Country by using his influence. Some analysts said that they were encouraged by Mr. Sharif’s resolve, but that military courts could be seen as a quick fix in a judicial system with systemic flaws. Human Rights groups are opposing the creation of military courts and Lifting the Moratorium on the Death Penalty , But the Analyst are critical of their stance as they quote the example of Saudi Arabia , USA , Iran , China and a Number of other countries who are also executing their convicts , but are critical of Capital Punishment executions in Pakistan , as they are of the view that , terrorism and extremism and to control it is Pakistan’s internal matter , and as a Sovereign State , Nobody should be allowed to speak in the internal affairs of Pakistan. As Pakistani officials sought to respond to last week’s devastating attack, another assault occurred on Wednesday, this time in southwestern Pakistan. At least 27 people were wounded when a bomb went off in a crowded street in Quetta, the restive capital of Baluchistan Province, officials said. Five of the wounded were said to be in critical condition. Police officials said a remote-controlled explosive device had been detonated outside a storefront in Quetta. The device had been planted on a motorbike, said Abdul Razzaq Cheema, the city’s police chief. As The situation is highly fragile and explosive , so Quick and Long Lasting Decisions should be taken , as said “ Justice Delayed is Justice Denied ”. This entry was posted in Asia Pacific, Pakistan News and tagged army chief, extremism, General Raheel Shariff, Justice, Military Courts, Nawaz Sharif, pakistan, taliban, Terrorism, TTP. Bookmark the permalink.